We specialize in both women & men’s haircut styles & we take pride in working with what you have to help you express yourself through your hair. We understand the needs of our women clients who are loosing the thick hair of their pre-chemical treatment years. 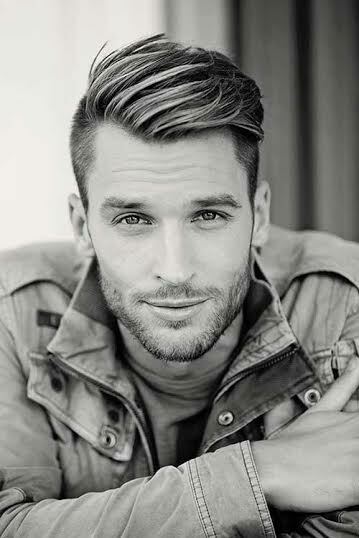 Men’s barbering is one of our preferred services & we understand that every man has their blessings, & that some may feel like their follicle blessings may fall a bit short. 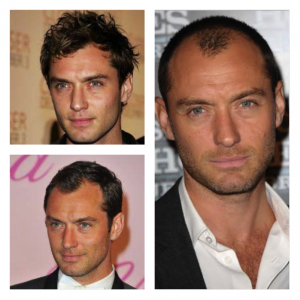 The stylists at Crimson have compiled Thinning Hair Advice & Inspiration for Women & Men to help you maintain what you have & develop a style that will make everyone feel proud & on point. 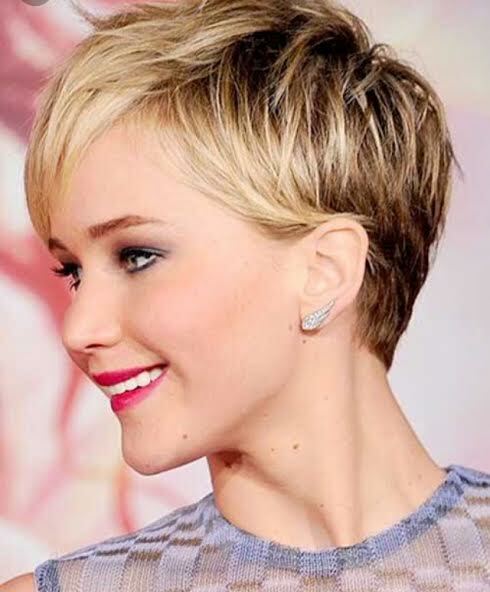 I love a cropped pixie for finer women’s hair. 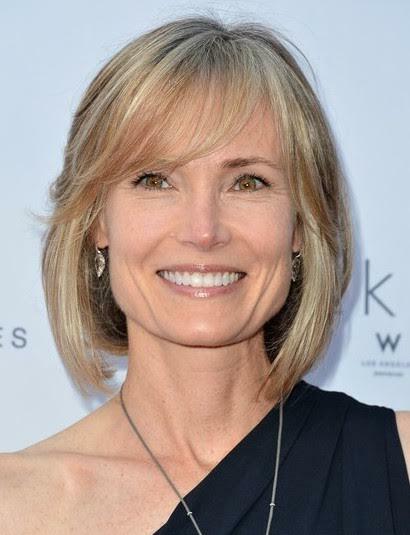 The shorter layers in the crown give volume and texture, while the longer front gives softness and versatility. The highlights through the top help “rough up” the cuticle and give dimension. Misting damp hair with Kevin.Murphy Anti.Gravity will help prepare the hair for your finishing product such as a dry wax spray like Kevin.Murphy Bedroom.Hair. My favorite products for women with thinning hair are are the Plumping.Line from Kevin Murphy, which is a three step system that helps make individual hair strands thicker for an all over fuller look. For long full hair, consider Halo Couture Extensions! The ‘miracle wire’ halo drapes around your crown: no damage, no commitment, all volume! Also endorses the Kevin Murphy Plumping.Line as a solution for woman struggling with thinning hair because the 3 part system (which using eyelash thickening technology) line all work together as a team to not only creat fullness when styling daily, but long term encourages the growth of healthy hair. Encourages you to “get to the root of the problem!” (love it!) Once you can zero in on whats going on, it is easier to plan a coarse of action. For styling, the less heat the better. Thinning hair is usually more delicate & texture powder can give the look of teasing without the damaging effects of back combing. I’ve been using all three of the hair thickening products faithfully for several months. I have definitely seen an appearance of thicker hair. My experience with the hair plumper was a bit mixed, I feel like it holds my hair more in place then actually doing anything. It also feels / appears a bit crunchy. The search for the best products to thicken and plump up strands is always on! Prep the hair with a texture spray such as Hair.Resort Spray by Kevin.Murphy. Blow drying the hair allows the product to absorb into the hair without getting “crunchy”. I recommend a matte finish pomade, such as Layrite Natural Matte Cream. It allows your style to hold while giving texture to the hair without greasy or stiff separation. Plus it’s water soluable so no buildup! Scrub hair with pads of fingers instead of nails to avoid hair loss. 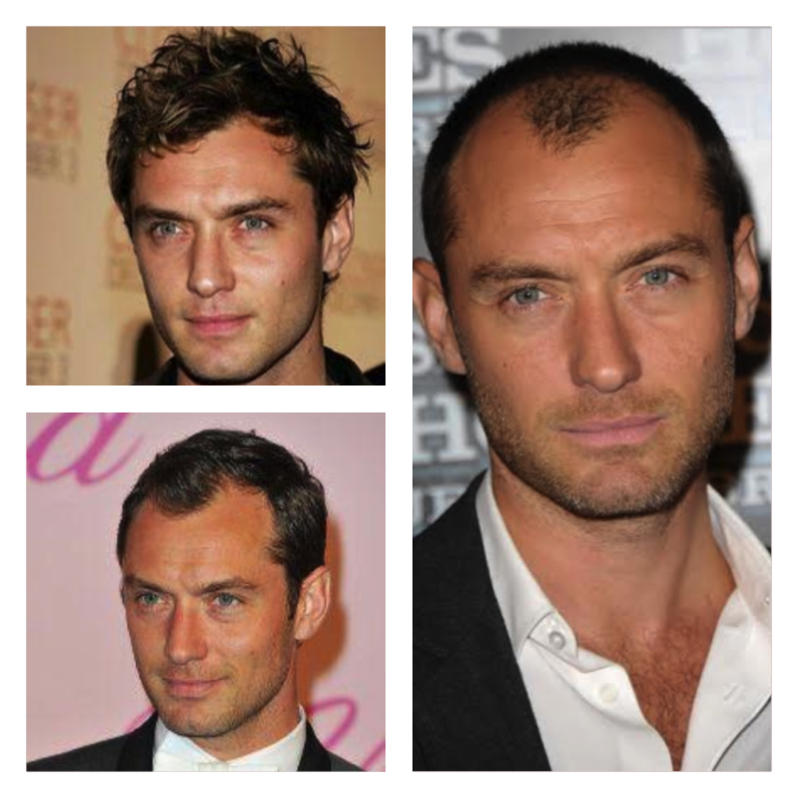 When it comes to a cut/style, take for example Jude Law’s looks for a receding hairline. Leaving the hair longer toward the forehead is great because it allows you to push the hair forward and make the hairline look fuller in recession areas. Eventually, a shorter cut will be best. For both men & women with thinning hair, I love Kevin.Murphy Powder.Puff because it gives hair a dry grit while making it feel and look more full. I advise communication & a product to repair the hair: It’s important to to speak to your stylist about your concerns/dislikes of your hair, whether it be a receding hairline, or if you’re experiencing thinning in the crown. There are different ways to cut the hair to disguise or take attention away from these areas before reaching for your clippers and taking it all off. My favorite product for men right now is the Kevin.Murphy Thick.Again line. The Stimulate.Me Wash & Rinse have a nice fresh menthol scent and a cooling sensation on the scalp. Pair those with the Think.Again leave in treatment to rejuvenate the scalp and give an all over thicker appearance! This guy’s cut is great because it looks like his hairline is going back a little, but by keeping it short on the sides and styling the length on top slightly forward and to the side it takes your focus away from his hairline. 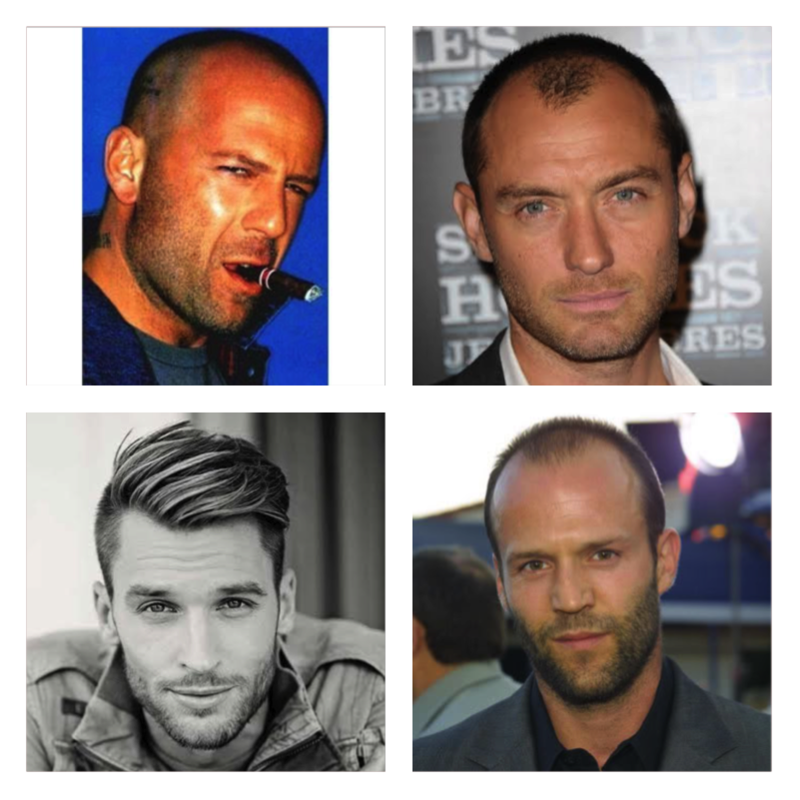 For guys with thin hair I always suggest leaving more length all over, and even more so in thinner areas. Longer hair will make it appear fuller and show less scalp. Also don’t style your hair with products that are too sticky or greasy. These products will cause the hair to clump together and get weighed down thus showing more scalp and less hair. Powder.Puff- volumizing powder plumps up the hair and has a lighter hold: it’s in a pink container Are you man enough for Powder.Puff?! 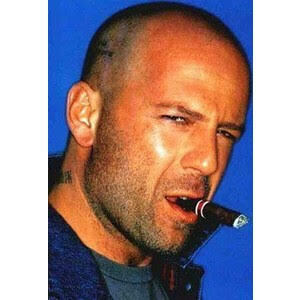 Eventually, if the thinning has taken over just shave your head a grow a beard! The “clean up” is imperative to maintaining a man’s style; neck trims and shape ups will keep the cut fresh between cuts and are a useful when growing into a longer style. For men who have finer wavy hair and air dry, Kevin.Murphy Easy.Rider is my go to product. It dries with fullness but tames the frizz and holds the style all day. Always take your style to a professional, who can personally advise ways to keep your locks locked down and looking sharp!